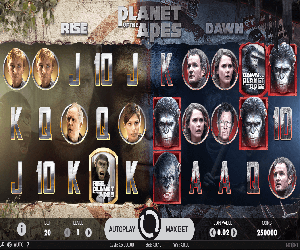 NetEnt has teamed up with 20th Century Fox Consumer Products and have released their long-awaited slot game, Planet of The Apes. The popular film series has spanned over generations for the last five decades and are happy enough to engage in the exclusive slot release. The action-packed slot game consists of 5 reels, 3 rows and 20 paylines. The game allows you to experience both movies: Dawn of The Planet of The Apes and Rise of The Planet of The Apes in one game. The most interesting feature of this game is that it includes a dual feature. Where you have two sets of five reels each, both displayed on the screen giving you double action. This allows you to play both, the Rise and Dawn reels both at the same time! Each set of reels is independent, and awards bonuses of their own. What Features Does the Game Include? Throughout the game, players get to experience: Rise Free Spins, Dawn Free Spins, Rise Bonus, Dawn Bonus, Scatter Symbols, Wild Symbols, Bonus Symbols, and Stacked Wilds. Receive a truly unique experience of the unique Planet of The Apes slot by NetEnt! Caesar is home!